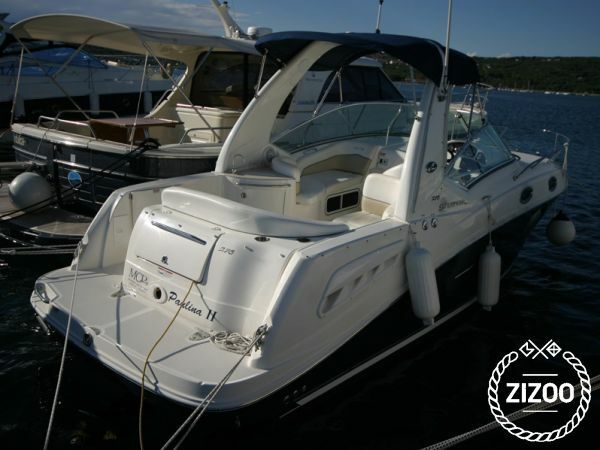 Sea rays are considered very elegant creatures so it is no wonder that this 2008 Sea Ray 275 Sundancer is designed with attention to every detail, to make it just as attractive. Modern but comfortable interior takes up to 8 people, while the cockpit seating and the enormous deck mean you will definitely not be walking all over each other while moving around. Active holidayers who enjoy the pleasure of navigation combined with curiosity of exploring love this boat, but if you prefer a laid back relaxing week, she will most certainly meet your expectations. Her powerful engine will take you to any of the islands south of your Punat Marina base on Krk in no time, all you need to do is decide on the routes. If unsure where to go, just ask your friendly charter staff - they will happily give suggestions to discover their beautiful country's treasures, as well as be there for you with every mile you cover. So stock up on treats and put your captain's hat on!